2.7 arranging for suitable induction programmes and training; consulting, where necessary, with all employees, leaders, helpers and volunteers on the implementation and effectiveness of this policy and of any necessary changes. 2.8 endeavouring to ensure that adequate funds and resources are made available for carrying out this Policy. 3 Overall responsibility for the fulfillment of this Policy lies with Church Meeting. 3.1 The appointed Health & Safety Officer is Mr. Christopher Clarke. 3.2 The Church Officers together with the appointed Health & Safety Officer. will be responsible for carrying out the implementation of the church’s policy and for the issue of supplementary policy statements where this may be necessary. 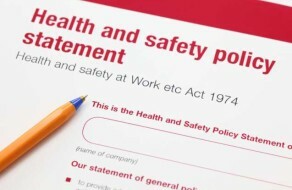 4.4 ensure that accident and other appropriate records are regularly inspected, maintained. 4.6 ensure that all Food Safety legislation is complied with, as far as the church is reasonably able to comply. 4.9 ensure that access to and from emergency exits and fire equipment are not impaired and that stairways and passageways are kept free from obstructions other than of a temporary and partial nature. Specific procedure and safety arrangements. Where actions are needed to reduce or eliminate risk, the Health and Safety Officer and the Church Officers will decide upon a time scale by which the corrective actions are to be completed. This will be based on the principle of “As Low As Reasonably Practicable” (Such decisions upon a time scale and corrective actions to be notified to church members as soon as is practical to do so). Any person discovering a hazard must inform the Health and Safety Officer as soon as possible. In the case of serious and immediate danger, the correct emergency procedures must be followed. The electrical wiring within the building(s) will be inspected every five years, or at a duration that has been suggested by the contractor performing the tests. A NICEIC contractor will perform the periodic inspection and test in accordance with BS7671 (formerly the IE Wiring Regulations). No person is to make any alterations to the electrical installation without prior agreement from the Church Officers. Portable electrical appliances will be maintained, inspected and tested routinely. This will be done at least every two years, or at a duration that has been suggested by the contractor performing the tests. Certificates of wiring inspections, alterations and portable appliance test records will be kept in the Health and Safety File. Please ensure that electrical equipment is used safely, following the manufacturer’s instructions. Do not overload sockets, avoid using extension leads where possible and take care to prevent tripping hazards when laying cables. The Fire Extinguishers within the premises will be periodically examined and tested as recommended by the Service Company (presently yearly). The Service Company will also advise on the purchase of replacement or supplemental equipment. The certificate for the inspection and test will be displayed for one year (or until the next inspection and test), after which it will be kept on file. Fire extinguishers will be examined for damage and use monthly by the Health and Safety Officer. Extinguishers must not be removed from their locations except in an emergency, or for the purposes of carrying out maintenance. Fire extinguishers should only be used by persons competent in their safe use, taking care to use the correct type of extinguisher for the hazard in question. First aid kits are available in the Upper Room and downstairs in the Kitchen area of the Schoolroom and are clearly marked. If the contents of any first aid kit is used, the Health and Safety Officer must be informed. First aid kits will be checked regularly by the Health and Safety Officer to ensure that the contents are complete, that none of the contents have dates which have expired and that no medicines or other preparations are contained within the kit.